TYSONS, Va., Oct. 23, 2018 (GLOBE NEWSWIRE) -- Alarm.com (Nasdaq: ALRM), the leading platform for the intelligently connected property, today announced that its award-winning Smart Thermostat has earned ENERGY STAR® certification. Extensive, independent testing, as required by the Environmental Protection Agency for ENERGY STAR® certification, confirmed that the Alarm.com Smart Thermostat can save homeowners between 9 and 16 percent of energy when heating, and between 15 and 23 percent when cooling. With the typical U.S. home costing an average of $900 to heat and cool annually, the Alarm.com Smart Thermostat offers a significant opportunity to save money. Designed specifically for the smart home and smart business, the Alarm.com Smart Thermostat combines sleek hardware, sophisticated cloud services and real-time intelligence from an ecosystem of connected devices. With more information about its environment than standalone connected devices, and a detailed understanding of users' activities and needs, the Alarm.com Smart Thermostat automatically finds more opportunities to save energy without impacting comfort. 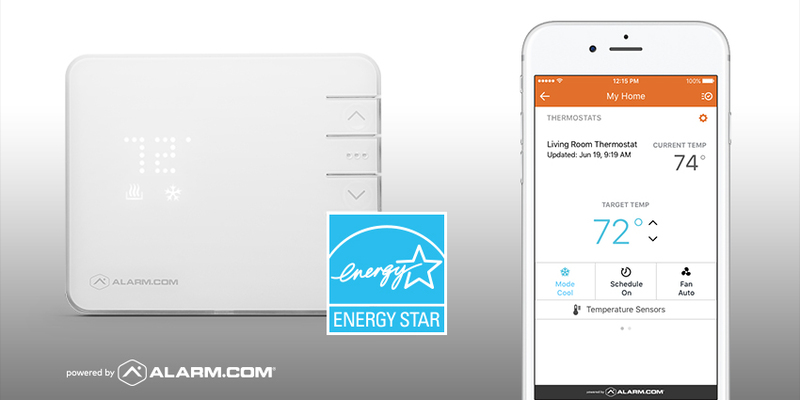 "We're pleased to announce ENERGY STAR® certification for our Alarm.com Smart Thermostat, which leverages the Alarm.com platform to deliver advanced energy management features with proven savings for consumers," said Dan Kerzner, Alarm.com's Chief Product Officer. "We've also engineered the Smart Thermostat to make it easy for our service provider partners to install and support. Home and business owners, as well as our service providers, can adopt our Smart Thermostat with confidence that it will generate long-term value." The Alarm.com Smart Thermostat offers a broad range of effortless energy management features to find more ways to reduce energy waste. Responsive Savings is a unique capability that automatically responds to activity, occupancy and weather patterns. An open door or window automatically adjusts the thermostat to avoid waste and alerts the homeowner. Geo-Services uses location-based automation to dynamically adjust the thermostat to keep up with the most unpredictable family schedule. Extreme Temps automatically adjusts the temperature set point on those extremely hot or cold days when a small change can provide big savings without impacting comfort. The Alarm.com Smart Thermostat is intelligently integrated with other connected devices around the property to enable responsive automation and easy control. Arming or disarming the security system can trigger the thermostat to automatically adjust. With Alarm.com's Scenes feature, a single tap on the mobile app or voice command can adjust the thermostat along with other connected devices in the property. With Precision Comfort, the Alarm.com Smart Thermostat delivers comfort to the rooms where people live, not just where the thermostat happens to be. Using discreet remote temperature sensors, easily placed around the home, the Alarm.com Smart Thermostat can optimize the home's temperature for any room at any time. * Typical savings were determined using 12 months of granular thermostat interval data from thousands of thermostats installed in actual properties. That data was then processed using the ENERGY STAR CT Field Savings Software, which is provided by Energy Star in order to generate verified savings estimates.